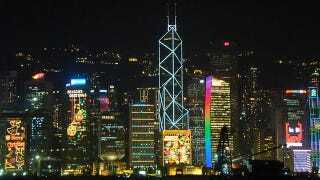 Hong Kong has one of the most expensive housing markets in the world, with home prices rising 70 percent since 2009. But a new real estate niche market offers greatly discounted home prices, if you're willing to bunk with the former residents' ghosts. Many Hong Kongers believe that the ghosts of people who died violently, thanks to an accident, murder, or suicide, haunt their former residences and bring bad fortune to the new occupants. As in the US, Hong Kong home sellers are required to disclose whether the previous resident died in the home, and potential buyers do rigorous background checks less they get stuck with a vengeful spirit. The superstition is so pervasive that prices on haunted homes can be 20-40 percent below market. That kind of discount has brought out some less superstitious speculators, mostly expats looking to buy up cheap property in nice neighborhoods. These investors actively follow violent tragedies, hoping to snap up a hongza — the Cantonese term for haunted house — of their very own. 20 years old anorexic female with body weight of 70 lbs, fell and fainted at home. She was found dead in the hospital. 36 years old burnt charcoal at home due to debt and relationship problem and was found dead by his mother. Young female texted and asked her boyfriend to meet her but he sent his sister instead. Victim jumped off the building in front of the sister. 67 years old female blindfolded herself and jumped off the building due to her suffering of insomnia. Add one delightfully sociopathic neighbor, and you've got the recipe for your very own Hong Kong Horror Story.